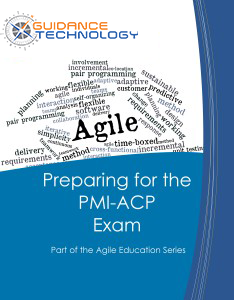 We are excited to announce our new 3 day instructor-led PMI-ACP® Prep course. This highly sought-after class is designed specifically to help you pass the PMI-ACP® certification examination. Earn the 21 contact hours needed to be eligible for the PMI-ACP® certification. Free access to our PMI-ACP® Practice Exam with over 370 questions. Guidance Technology also provides a certificate of completion of the Course for each participant who successfully completes the course. To learn more about the PMI-ACP® Certification, click here for more details.